Jason Ferruggia is a professional fitness coach who specializes in high-performance mass development. A former 98-pound weakling, Jason has gained over 60 pounds of muscle since he began his journey more than two decades ago and has helped thousands of others achieve similar results. I grew up with a pair of pipe cleaners hanging from my shoulders. Every T-shirt left me with several inches of cotton flapping in the wind above each elbow. If you're in the same boat, and you've also been struggling to build any size on your biceps and triceps, I can help. Check out these four arm-building tips below, and get ready to start building some muscle. I'm all about training with heavy weights for almost everything, except for direct arm work. Heavy biceps curls and triceps extensions usually lead to elbow problems before they lead to huge arms. Cellular swelling is an essential component in muscle growth and the best way to achieve it is with lighter, higher rep sets. Make sure that you actually feel the burn in your muscles and not your joints. Instead of piling on the plates and doing heavy sets of six, try lightening it a bit and doing sets in the 10-15 rep range, where you squeeze the muscle as hard as you can on each rep. 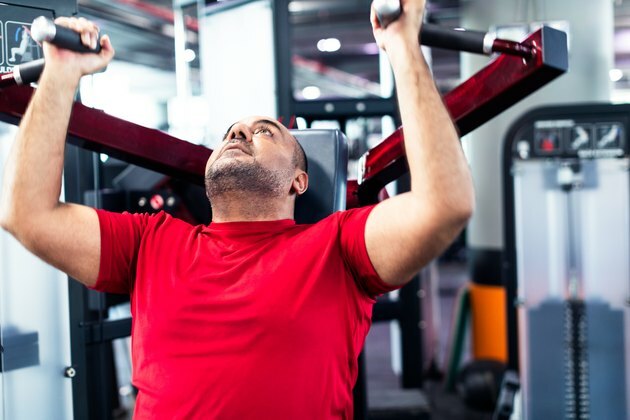 This doesn't mean you should use a pair of five-pound dumbbells, but rather a weight that allows you to achieve 10 or 12 reps.
Don't let your ego take over when training arms, and remember that the guys with the biggest guns in the world are rarely those who curl the heaviest weights. In fact, I know guys who have 20-inch arms and they rarely curl anything heavier than a 45-pound dumbbell. Don't be the dude with 11-inch biceps curling the 50-pounders. While you're pumping up your arms with sets of higher reps, you want to be conscious of maintaining constant tension on the muscle. You shouldn't be pausing at the bottom of curls, or completely locking out at the top of tricep exercises, where the load is supported by joints and not muscles. Stop just short of lockout at both the bottom and top of each rep, and keep moving throughout the set. This technique ensures more muscle growth. This one is going to take some visualization on your part. Imagine you're doing a standard barbell curl. You squeeze your biceps as hard as you can on the way up. Then, as you start the lowering, imagine you are doing a reverse grip triceps pushdown. Consciously contract your triceps and try to push the bar back toward the ground. Obviously, you're working with gravity and not against it, so the bar is going to return to the start position regardless. By employing this little trick, you will ensure a more intense contraction of the biceps at the start of each rep. When doing tricep exercises, do the same thing. At the bottom of a cable pushdown, contract your biceps and imagine you are doing a reverse grip curl. Squeeze the biceps and try to curl the weight back up. When you get to the top, immediately switch the focus to the triceps and push the weight back down again by squeezing as hard as you can. When utilizing this technique, be sure to take a good two to three seconds for the negative or eccentric portion of each rep. These days most gyms have a set or two of battling ropes. They are the thick ropes that were previously only seen on boats, and can actually be one of the best bicep building tools. There are two ways to use the ropes to stimulate bicep growth. The first way is to do inverted rows. Loop the rope over the top of a chin up bar, then grab an end in each hand. Lay your body back toward the floor and simply perform rows with your body weight, coming up until you can't pull your arms back any further and your hands are even with your torso. The second way to use the rope to build biceps is to attach one end to a sled and then do hand-over-hand rows for the entire length of the rope. Use a weight that allows you to take 40-60 seconds to complete the set. This exercise builds big biceps while also thickening your forearms, widening your back and strengthening your oblique muscles. If you've got access to a rope like this, this is an awesome bang-for-your-buck exercise. Start utilizing these four tips in your training today, and let me know how they work out for you.